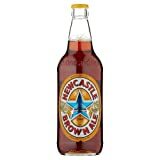 Explore fantastic offers on Newcastle Brown Ales from our merchants. Compare current prices, look for special deals and voucher codes to buy the best ale at the best possible price. 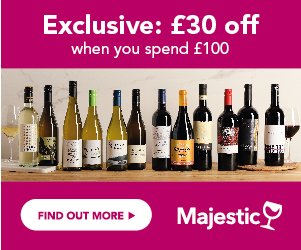 Sign up to Price Alerts and we will send you an email as soon as your favourite bottle gets discounted. Newcastle Brown Ale, aka. ‘Newkie Brown’ or ‘The Dog’, used to be made exclusively in Newcastle upon Tyne. It was created in 1927 by Colonel Jim Porter. Not a year passed since the production started, and the beer won a prestigious gold medal at the International Brewers' Exhibition in London. Soon after that, the bottle was labelled with the characteristic blue star. After World War II, the Newcastle brewery was transformed and merged with other breweries, which raised profits and facilitated the export of their beer to other countries. 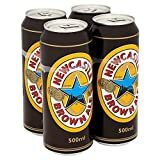 In a few decades, Newkie Brown became one of the most popular beers in the UK, with many fans in the whole Europe and the USA, where it is known as Clint Eastwood’s favourite beer and was advertised by Elisabeth Hurley. The makers intended it to compete with the famous Burton ale. Indeed, this beer made it to the global stage. Lately, in 2017, Heineken decided to move the beer’s production from the U.K. to the Zoeterwoude Brewery in Holland. 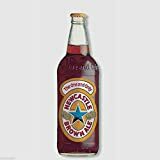 Newcastle Brown Ale is auburn in colour, full-bodied, with nutty and fruity aromas responsible for a slightly sweet finish. It’s not too intense, with a characteristic aftertaste. 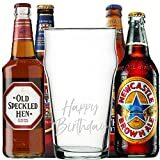 It is perceived in the UK as a working-man's beer, with a long association with heavy industry, traditional and characteristic to the North-East of England. Outside of the UK, it is perceived as being a trendy, hipster beer, trusted for its consistently premium quality. It was one of the first beers to be bottled in a clear glass and this tradition is kept to this day.